Weartested: Eric Koston 3 Hyperfeel « .::Skatehere.Com::..滑板中文第一站.. You’ve seen the hype on instagram, facebook and skate websites, Nike SB and legendary skateboarder Eric Koston has teamed up again for the third time to create something completely different from the Nike SB line-up, which includes his two previous pro models. 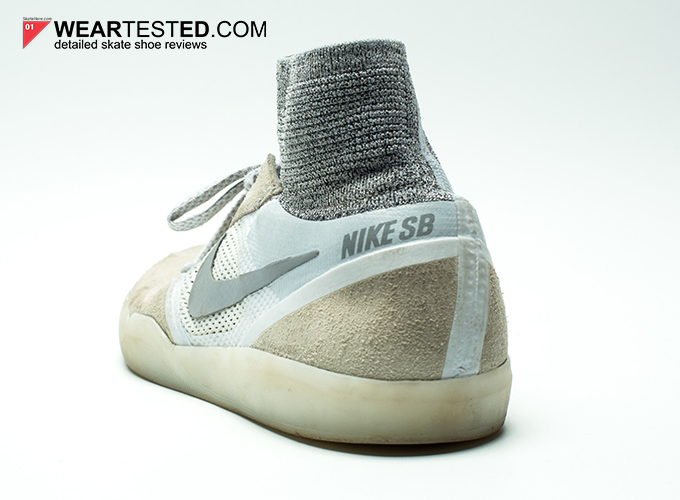 Koston being a huge sneaker fan himself, knew exactly what he wanted and how it would perform; the shoe’s most noticeable feature is the attached “sock”, which takes inspiration from the flyknit collar of the Nike Majista football boot, and helps give a secure lock-in feel for your ankles and heels. This is the exact kind of security you need in a skateboard shoe whether you’re pushing down the street or trying to get that trick over and over a stair set. A new feature this year that Nike is pushing is the Hyperfeel concept, which the Koston 3 is one of the first to utilize. This includes a drop-in Nike lunarlon midsole which is thin enough for you to be able to feel your board when performing more technical tricks, and a heel that features a thicker Lunarlon foam with the bonus of a Nike zoom air unit to protect you with heavier impact tricks. With technical aspects aside, lets talk about how the third shoe in Koston’s Nike SB line performed after 10+ hours of wear testing. The Eric Koston 3 Hyperfeel fits smaller, we recommend getting a half size bigger. Most of the time, when it comes to durability, certain areas of the shoe such as the toe-cap itself, the side-walls or the out-sole etc outshine and prove to be more durable than other parts of the shoe. But this wasn’t the case with the Koston 3; all parts of the shoe exceeded expectations in terms of durability and all proved to be engineered with the wear and tear of skateboarding in mind. Personally, I fear of kick flips because I’m afraid that they’ll just burn through the shoes I’m wearing, but for the sake of the weartest, I really wanted to see how the one piece toe-cap would hold up so I did kickflips where ever and when ever. The one piece toe-cap withstood session after session and therere was no show of any holes. With that said, the laces ripped quite fast, so the positioning of the shoe eyelets was a bit too in the direct line of fire for flip tricks. I was, and still am surprised of how incredibly durable the suede is around the usual wear and tear areas. As any skater would do, I instantly took notice to the Koston 3’s outsole. 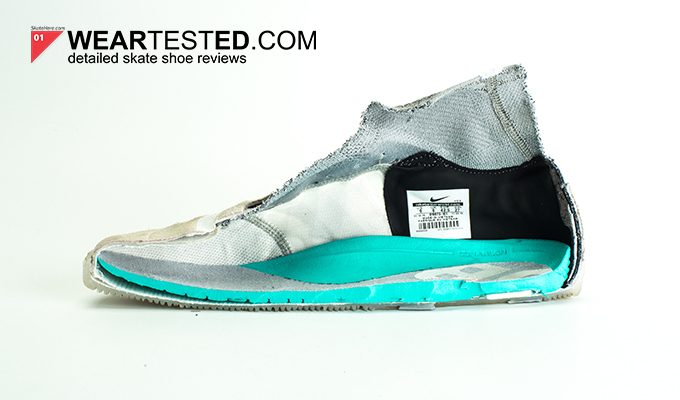 The soft rubber outsole didn’t look too promising, and I didn’t think they would any better than a shoe with a harder rubber…but this wasn’t the case either! To my surprise, the outsoles were able to endure all the elements of skateboarding, games of S.K.A.T.E, cruising the park, filming sessions, to pant-falling foot dragging. The Koston 3 comes with a drop-in Lunarlon midsole equipped with a flexible web design. The midsole pans out to be thinner towards the forefoot, but gets much thicker in the heel area which features the iconic Nike Zoom air bag for added heel protection. This design benefits the rider without losing any of the board feel of a flat bedded shoe and helps protect your heels beyond the lifespan of the shoe. A small detail that was also quite noticeable was the support in the arch of the foot, which helped keep my feet less sore after a long session. These insoles are definitely one of the more technical insoles I’ve come across. 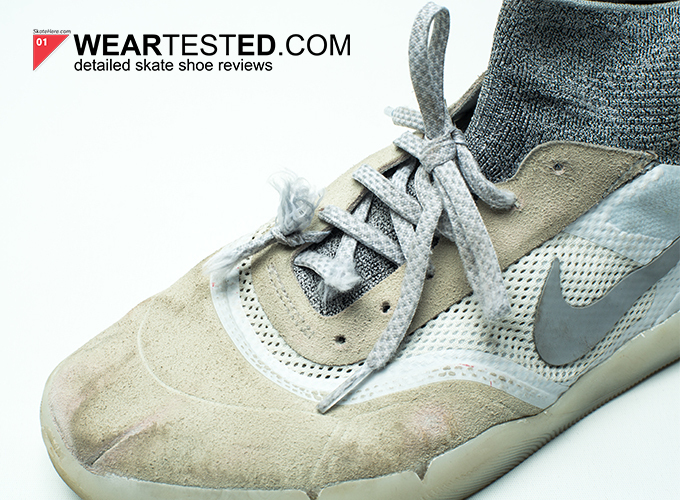 Throughout the 10 hour weartest, the Nike SB Koston 3 held its shape up very well. The one piece suede toe cap held it’s structure and offered no loose seams for the toe box to lose its shape from skating. More impressive was the flyknit sockliner of the shoe, which held up the shoes lock-in feel extremely well, inadvertently increasing the lifespan of the shoe’s stability. Often, when your feet get sweaty from skating, the shoe absorbs moisture and the shape of the shoe changes significantly, losing much of it’s structure and stability. However, with this shoe, the shoe’s shape and structure was very well maintained and almost showed no signs of change over the first few sessions. Moreover, the heel of the shoe proved to extremely stable; there was an added plastic wall to keep the shoe’s heel shape upright and also protected the heel to achilles tendon well from boards jamming into the heel. The boardfeel of this shoe was very impressive. Surprisingly, even as a cupsole model, it had very similar features as a vulcanized shoe: the Lunarlon cushioning elements and the added Zoom air bag did not overpower board feel and felt relatively thin, which made it skate able right out of the box. Grip at the beginning was not the best. It may have been this sole’s material, which seemed like a gum sole but with much less grip. The grip with more skating, got better after being broken in. 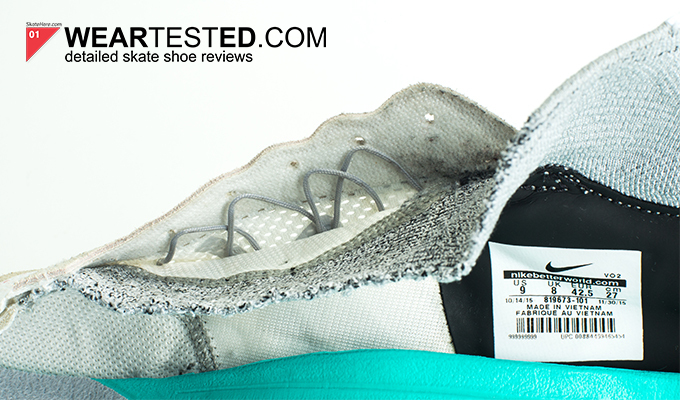 Rivets are added to the cupsole outside in areas outside of the sole which helped provide better flexibility. This helped increase the flexibility and also made the grip feel very consistent each time I put em on to skate. 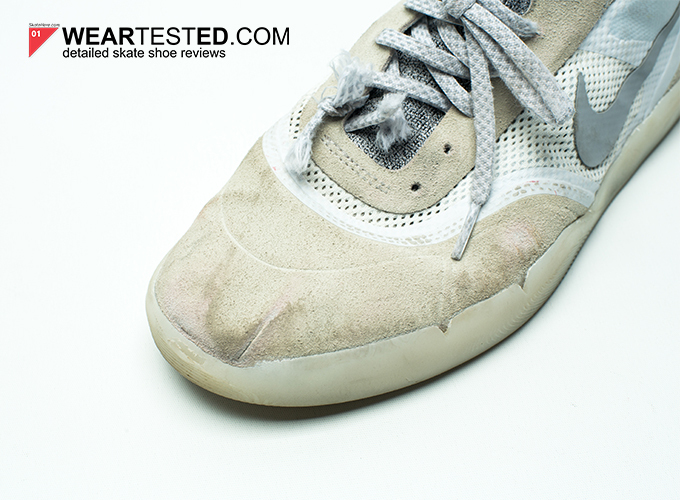 This may also have to do with the very simple and strategic design throughout the entire bottom of the sole which also showed little abrasion throughout the wear test time period. With regards to comfort, the shoes right out of the box get some getting used to. Nike really spent time in making the Eric Koston 3 as different from traditional skate shoes as possible, which is why initially, the break in period takes a bit longer, and can bit a little uncomfortable at first. But with that said, once the break in period is over, the benefits from the shoe’s technical elements is well worth the initial discomfort. The upright sock collar looks a bit awkward at first, but does amazing in securing your feet and stabilizing your ankle to prevent ankle rolls. 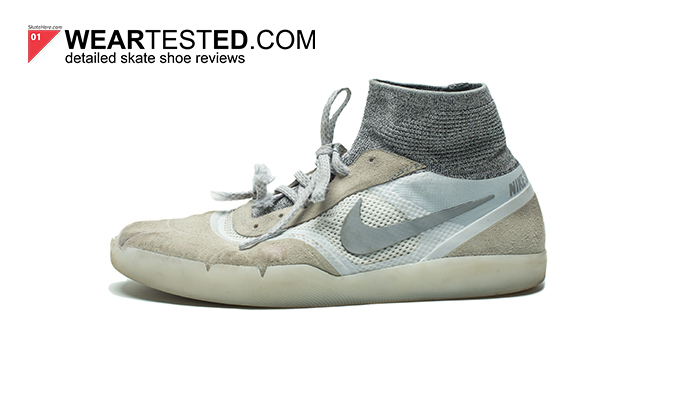 Breathability was a drastic improvement from the past 2 Nike SB Koston models; as can be seen in the pictures, mesh ventilation is found throughout the mid-section the shoe, from the arch area to where your toes meet your foot and mid foot area. Another innovation of Nike technology which helped create great stability is the hyperfuse taping used throughout the shoe. The seamless hyperfuse taping wrapped around the core stabilizing areas of the shoe’s midfoot and gave it a bit more structure when put under stress (pushing and walking). One added feature that should be mentioned are the lace loops that are hidden behind the eyelets of the shoe. This tiny feature helps to secure the shoelaces when skating and even makes the laces look much more proportionate in terms of spacing. 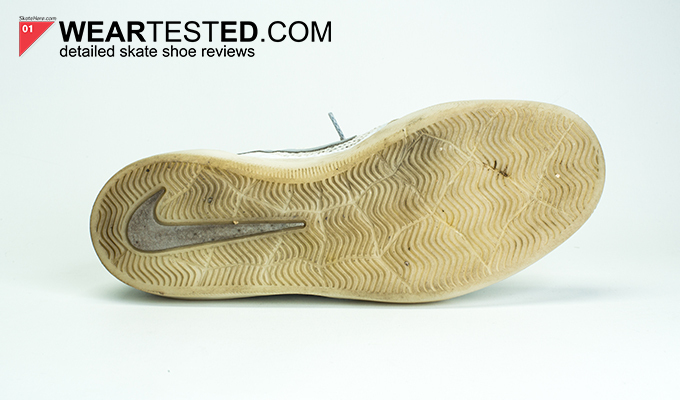 Overall, the shoe was quite light, which was very impressive given the durable suede used through wear and tear areas. The introduction of the Koston 3 Hyperfeel to the skateboard world is a strong one; it’s technical elements excel in terms of cushioning, durability and stability, but it’s comfort and grip could be strengthened.